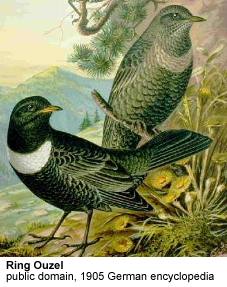 The Ring Ouzel (Turdus torquatus) is a European member of the thrush family Turdidae. It is the mountain equivalent of the closely-related Blackbird, and breeds in gullies, rocky areas or scree slopes. It breeds in the higher regions of western and central Europe and also in the Caucasus. Most populations are migratory moving south in winter. Ring Ouzels are omnivorous, eating a wide range of insects, earthworms and berries. They nest in bushes or similar, laying several eggs in a neat cup-shaped nest. They do not form flocks, although several birds may be loosely associated in suitable habitat. Adult males are all black except for a white crescent on the breast and a yellow bill. The wings have a silvery appearance due to white feater edgings. The female is similar but duller, and young birds often lack the breast crescent. Juveniles have brown plumage. The male sings its loud and mournful song from trees or rocks.